Why are family firms more (or less) able to be successful over the long term as compared to other types of businesses? This is clearly one of the core questions of research on family firm research. While much research has been devoted to answering this question, our knowledge is still much fragmented. Thus, in this conceptual article, my co-authors and I call for more integrated research on family firms and their (dis-)advantages. We conclude that much research on, for instance, resources of family firms as well as governance structures of family firms has been conducted, but far too few effort has been dedicated to exploring the nexuses of those aspects. Besides calling for more multi-theoretical theory building, the paper discusses, amongst others, the following topics. 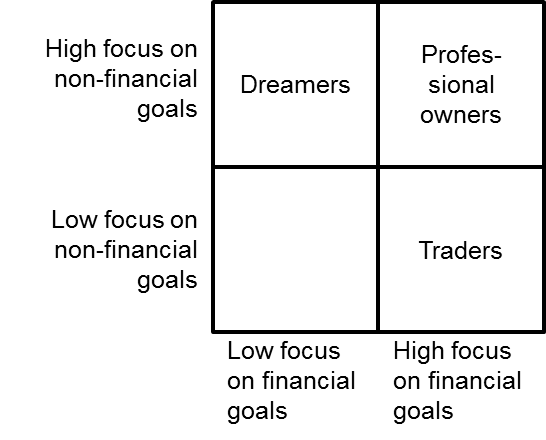 “Goal ambidexterity”: We discuss three different types of family firms that are different in terms of their goals: Dreamers that focus on non-financial goals, traders that focus on financial-goals, and professional owners that manage both, financial and non-financial goals. We argue that professional owners (who possess “goal ambidexterity”) will benefit most in the long term. We further discuss strategy formulation in family firms and note how an effectuation approach can be helpful not only for startups as discussed in prior literature, but also for family firms. Moreover, we also discuss the different layers of governance that family firms need to be aware of: firm governance, owner governance, family governance, wealth governance. We highlight existing literature and discuss the interwoven nature of those aspects.